Anyone know how FCM works with award tickets? Booked a one-way with miles, SFO-LAX, and tempted to take it ($83), but want to be able to refund this ticket in full. Do I lose the $83 if I cancel the ticket? Yes. The upgrades are non-refundable and there's no exceptions based on status. Location: LAS - where you can get married and divorced in the same 24 hour period. Perfect for the woman who's saving herself for marriage and the man who wants a one night stand. tI looked at my reservation today to see if seats changed or any deals on FCM. I can upgrade to FC from LAS-LAX for only $840.27. Or I can buy a fully refundable FC ticket on the same flight/date for $325.30. I wonder who thought this through? The algorithm for selecting fcm seems off. The offers I am getting this year are about 200% of the original ticket price whereas they were about 20-30% of original ticket price last year. And I generally buy W fares. Something seems off since they did the option to pay with miles for upgrades. I thing the issue above is that OP doesn't have a LAS-LAX fare. Rather they have an LAS-LHR fare. Which means an ineligible international segment. My guess (it's purely a guess) is that the system is being made to break the fare and upgrade the LAX-LHR fare to one that works with LAS-LAX in F or that it's having problems allocating fare between segments. Regardless I just did an FCM few days ago on a normal one stop domestic fare and had no issue with pricing. (Both miles and cash amounts were correct) LAX-SEA-AUS. 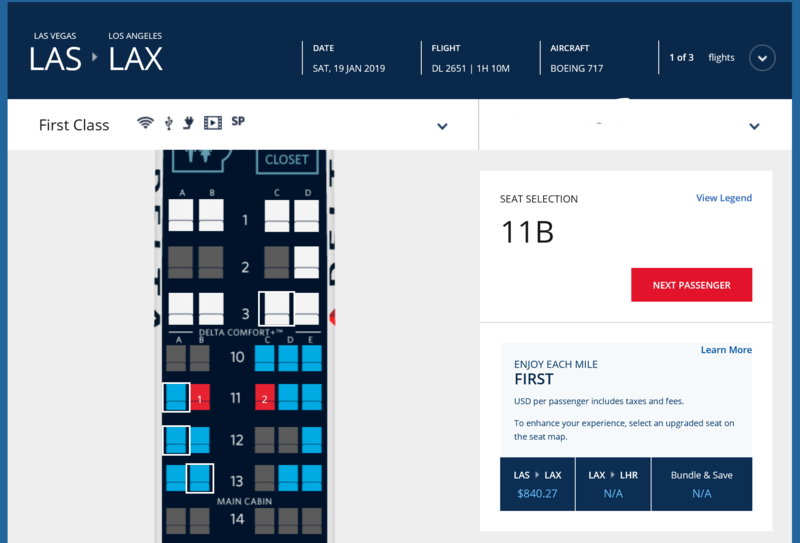 Upgraded LAX-SEA for $79. SEA-AUS was medallion upgrade, LAX-SEA wasn't going to clear as it was last minute purchase with other DM higher on list. My offer for a DTW-MDW award flight at the end of month is unchanged -- $74.18. I was offered a buy-up into first-class on a 737 from Detroit to Atlanta for $181.68. No thanks. PWM-JFK next Thursday for $187. That's about a 45 minute flight wheels up, wheels down. I think you are right. Similar, my parents are booked in G/W AMS-DTW-STL in a few weeks. I booked their tickets and see their FCM offer DTW-STL which is around 500EUR (about $550) which is in line with buying a P fare (now D or I probably). I’ve had domestic itin buy-up offers DTW-STL recently as low as $79. Yea I've been seeing the same thing on a TPA-ATL-SAT return I have (I've already upgraded on the outbound which is via MSP with an RUC). $1560 FCM offer for TPA-ATL-SAT. I could go buy two new FC , round-trip tickets for $750 a piece. I'd happily buy-up on TPA-ATL-SAT for $150 (ie, move the decimal to the left one place) for the SDC flexibility but for $1500? It really makes me wonder if DL misplaced the decimal or if they have some other logic going on (either seeing if they can really get someone to buy-up for that or are purposely discouraging the buy-up to preserve F seats for other routes/tickets). this really shouldn't be its own thread, OP. There is already tons of discussion about nonsensical FCM offers in the FCM thread. Do FCM purchases even count for MQD? The CES is going on in LAS; that is why this FCM offer is out of whack. Puddinhead's thread got RBP'd as a redundant thread. I'm going to agree as questions long-answered in the primary FCM thread are now popping up here. This will be merged in moments.